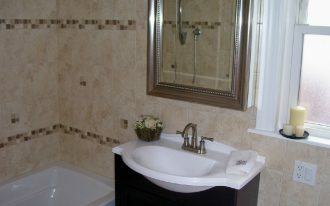 European bathroom vanities have been one of popular attractions for the customers. 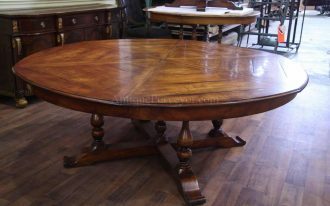 Main reason why these products are quite successful is they are produced in any styles, starting from classic to contemporary. 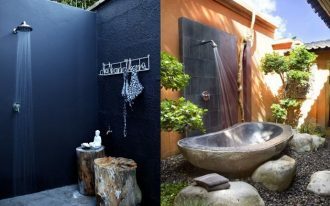 You must consider what style you are going to purchase for your bathroom. Consider one among these huge varieties of European bathroom vanity that fits your need and personal style. To convince you how the best they are, here are the general reviews for each unit of European bathroom vanities. Let’s check them out. 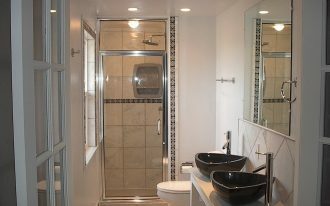 Modern bathroom vanity may be your first choice if you want to remodel your old bathroom vanity into a modern one. 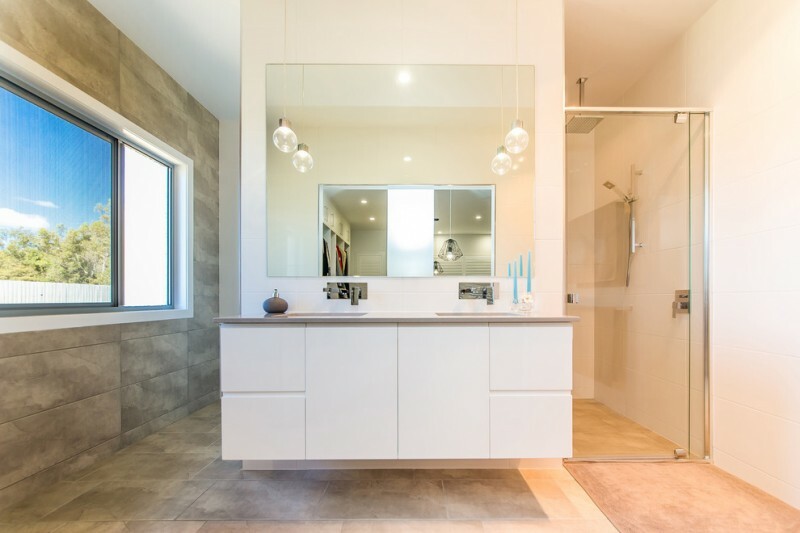 Floating and flat-panel cabinets look so identical with modern style, and frameless vanity mirror plus its bulb pendant lamps add more modern touch in this room. If you wanna try to have a traditional style bathroom vanity, this product probably grabs your interest. The storage is smaller and just consists of single sink and faucet. Oval-shaped vanity mirror with chrome frame be the best part for exposing the value of traditional concept in this bathroom. Use dark or black finishing for cabinets to create a beautiful contrast against the white interior. No cabinets, but shelves. The shelves here are used for a storage solution. You can also add baskets or boxes for additional storage space. Clean lines & modern bathroom vanity product quite matches for modern bathroom. They are so many options and one of them equip both cabinets and open shelves for storage solution. Such kind of product, of course, offers more options for storing your bath supplies. 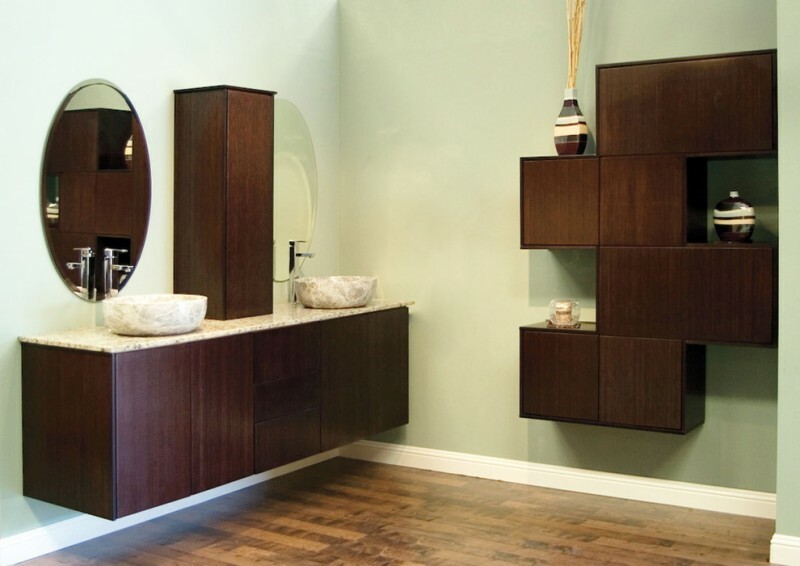 Floating modern bathroom vanity with chocolate bamboos finishing applied on cabinets and vertical closet addition. 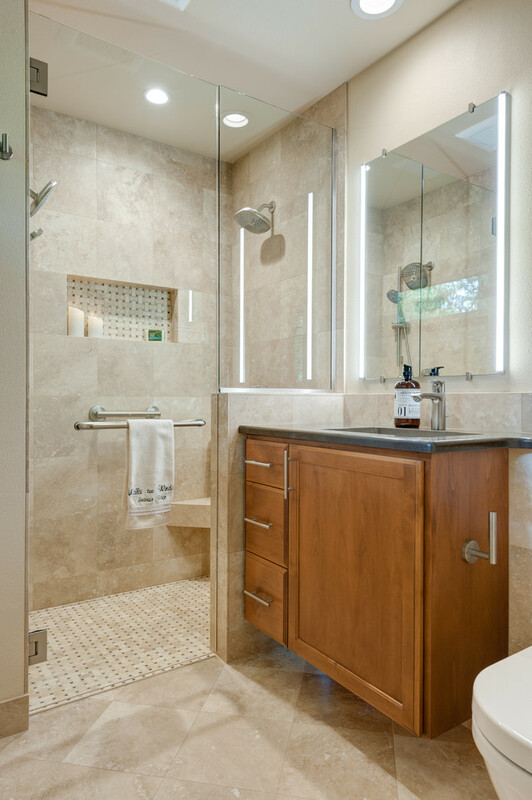 Overall design is trendy, really fits modern bathroom remodel. 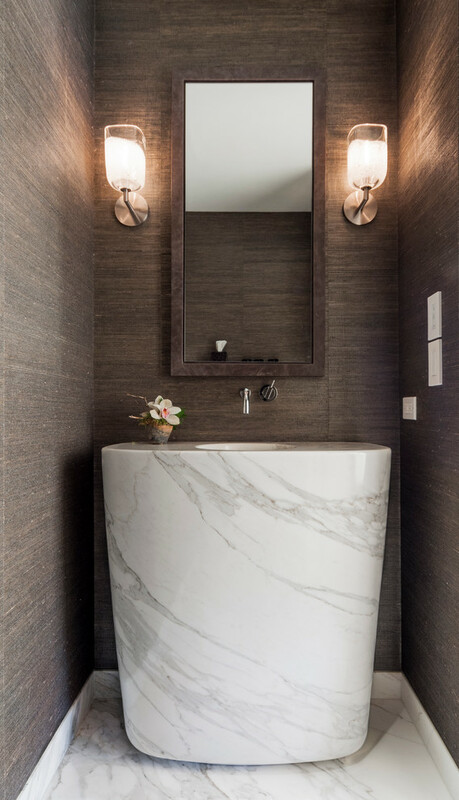 Expensive marble countertop and sinks give more credits to this vanity, and oval-shaped mirror without frame shows a classic look as another valuable credit in this bathroom. Clean lines bathroom vanity with wood finishing. A bit mass of wood is found at floating vanity’s base. The countertop is made of white laminate, as pure white as the sink. 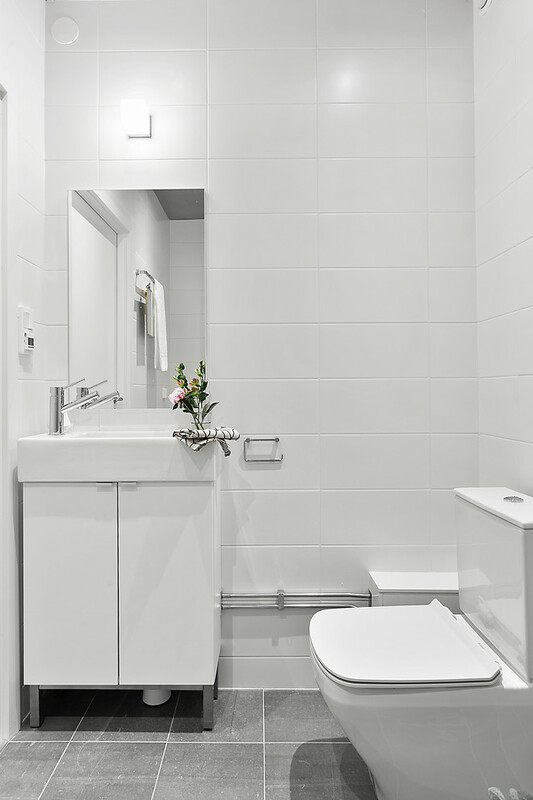 You probably want to add something fresh like such a vivid flowers to break out this clean-look bathroom. 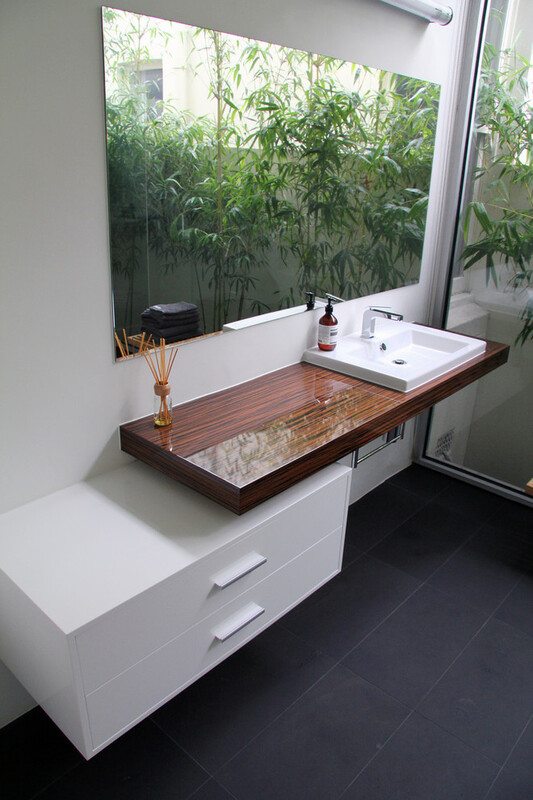 A stunning bathroom vanity in modern minimalist style. The vanity has two different countertops with different level of height. The higher one has been built from bamboo panel and integrated with modern white sink. The lower one is actually the cabinets which is finishing in pure white. Both countertops actually contrast with blue stone tiles flooring, creating a dramatic yet beautiful look. 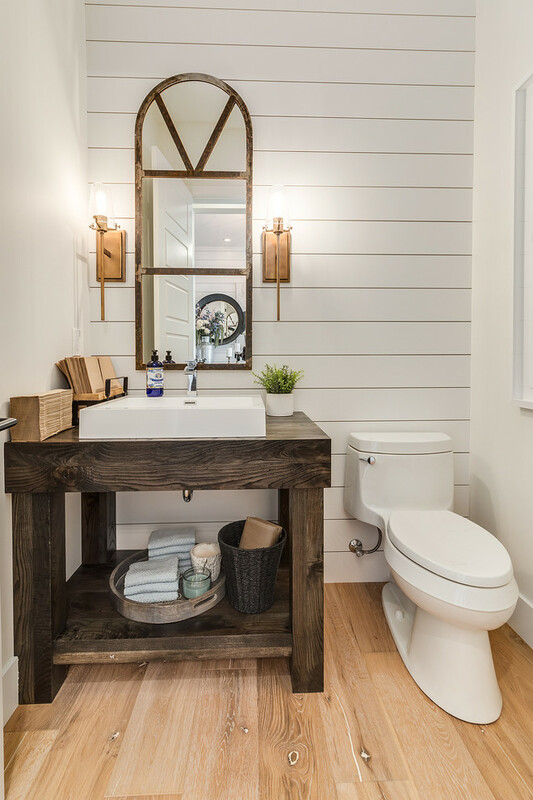 Dark-finishing, shiplap, and reclaimed vanity mirror obviously give farmhouse feel. 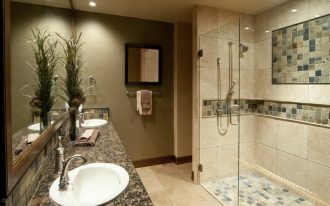 Make it more stunning by combining these values with white interior and bathroom fixtures. Re-use your small space with something simple, minimalist, yet functional. This idea is representing what you’re dreaming on. The vanity consists of unique solid wood counter for green glass sink and small extended shelf for a storage solution. The cabinet is built separately, being an independent storage unit. And the mirror, finally, is glued on wall without frame, giving simpler look. 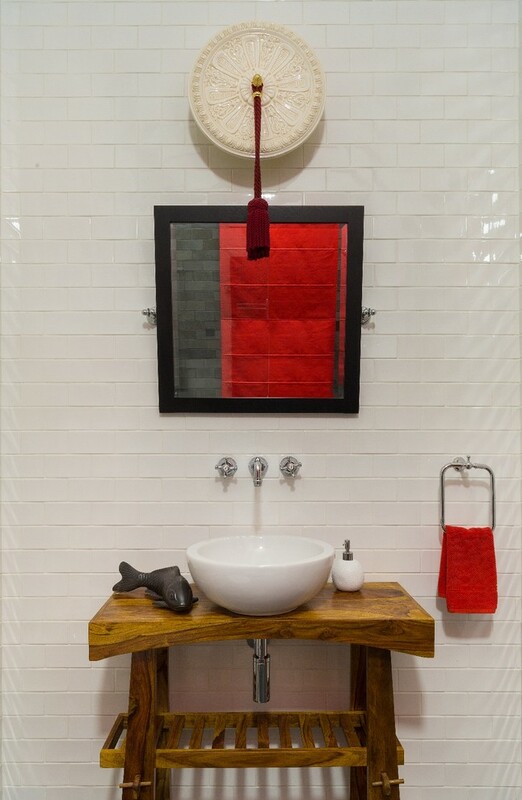 An inspiring and unique bathroom vanity accented by vividly red wall decor. 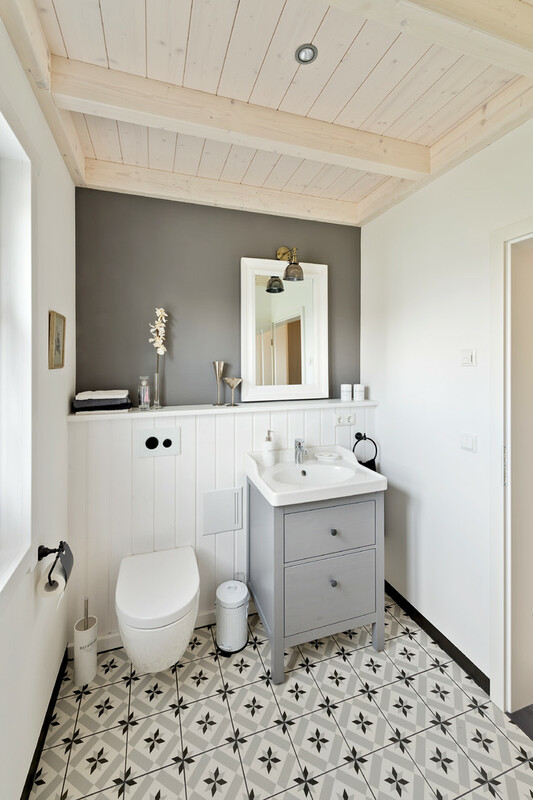 This wall’s accent is deliberately given to break out the boring & monotone look in this bathroom. All log components, starting from the vanity’s counter to mirror’s frame. 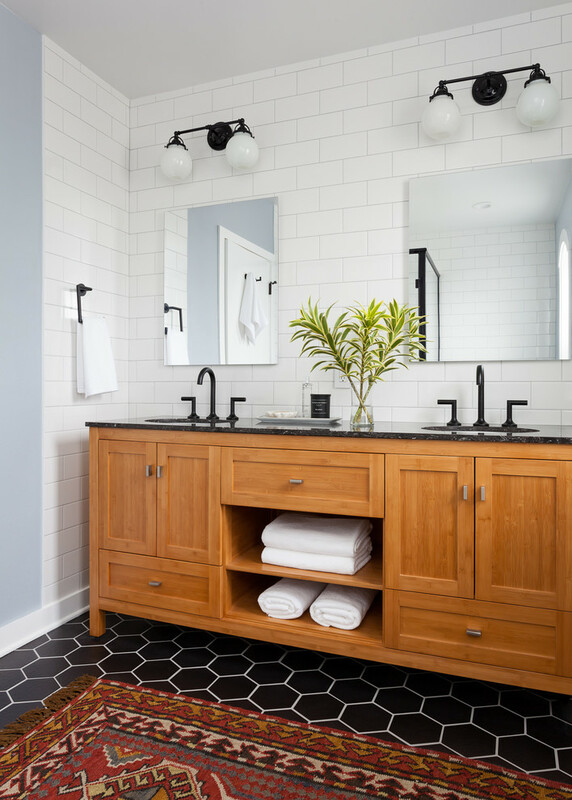 Cooper sink & black wrought iron faucet look so matched as a good pair. 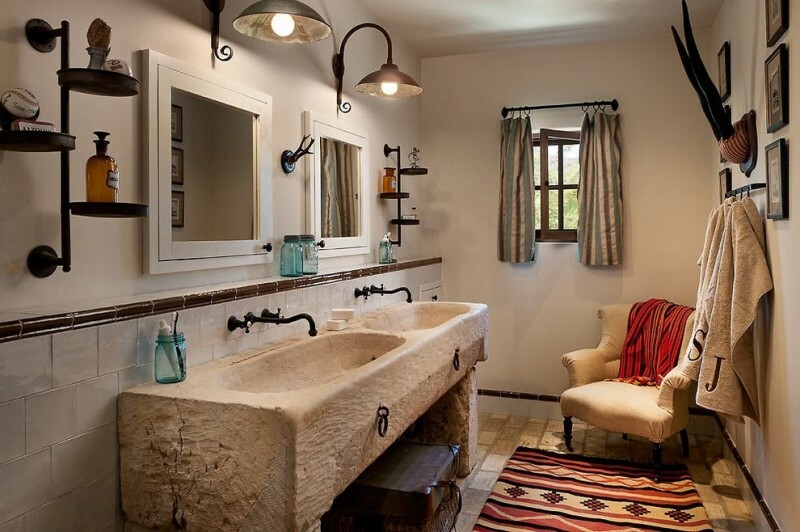 Here, the owner also uses stones for exposing and emphasizing another natural value in this bathroom. 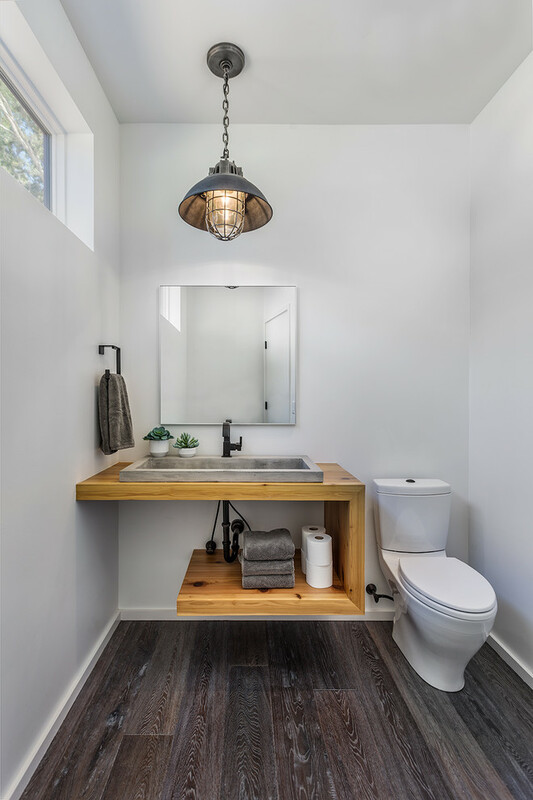 Mid century modern bathroom vanity idea – This is displaying clean yet natural look with wood as the additional component. The vanity’s counter is designed uniquely, having additional panel underneath as a shelf. At night, the lighting here is well provided by old yet stunning pendant lamp. An eclectic industrial bathroom vanity idea. The overall look is modern, but the elements are still exposing ‘roughness’ in a luxurious state. 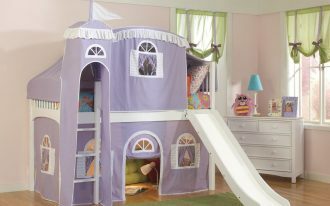 Each detail has been done by best carpenter, from the chainsaws to brad nails & chisels to achieve this final design. Tidy, clean, but still displaying the natural feel. 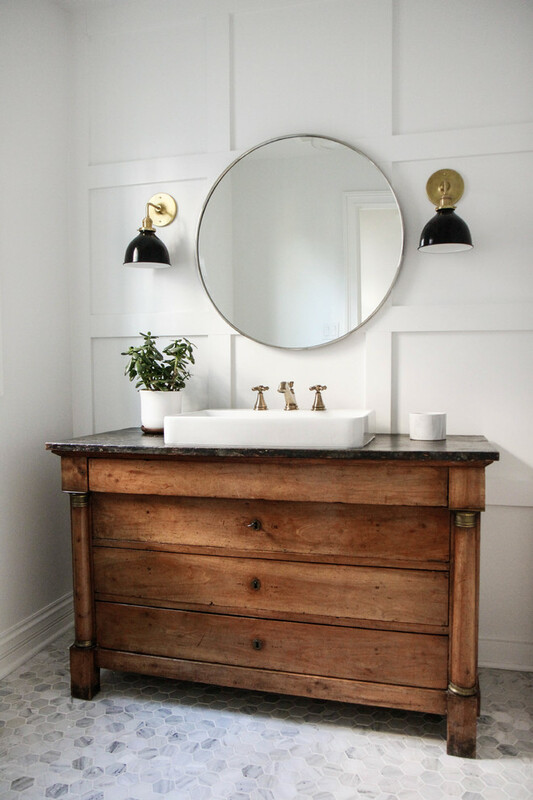 This farmhouse bathroom vanity uses solid wood for an original-look vanity base, while the mirror and lamps are accented by reclaim details for more ‘rough’ look, giving a completed wood color for this white-dominant interior. What a lovely style! 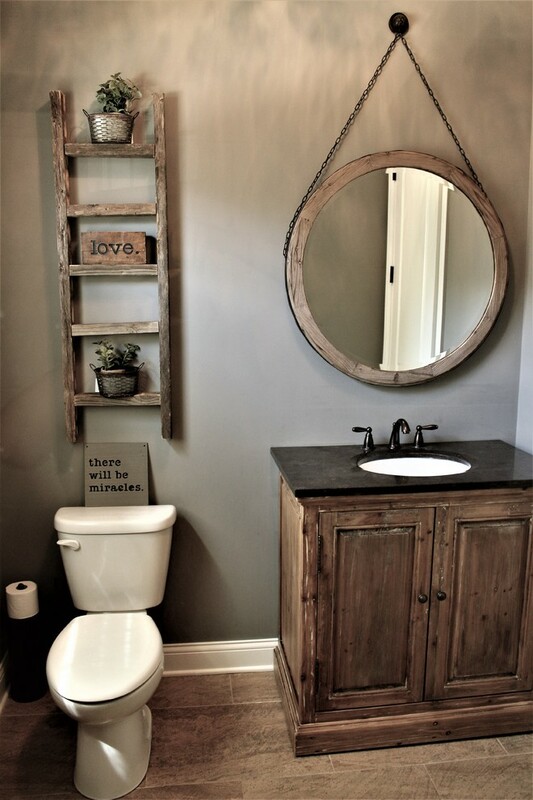 This vanity idea really matches for a small bathroom or even a downstairs powder room. Dark wood is used to build the cabinets and hard metal is used for their handlers. 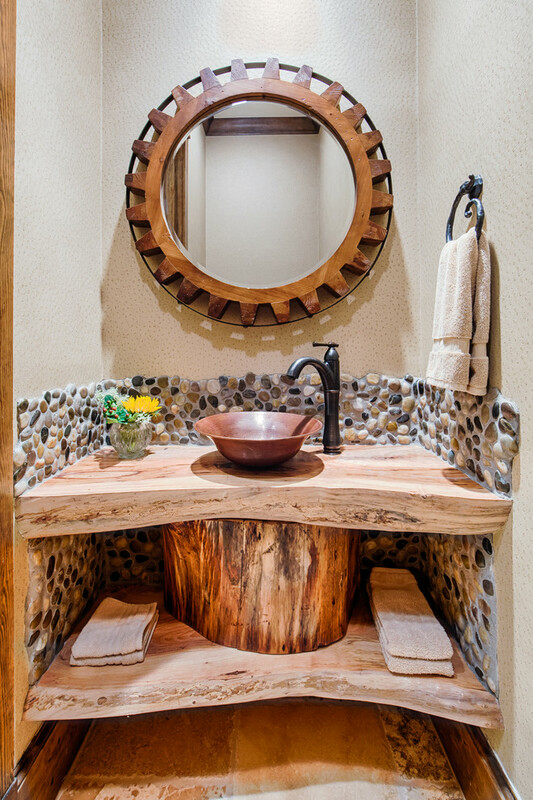 The stone countertop seems to be a perfect pair for this rustic style bathroom vanity. 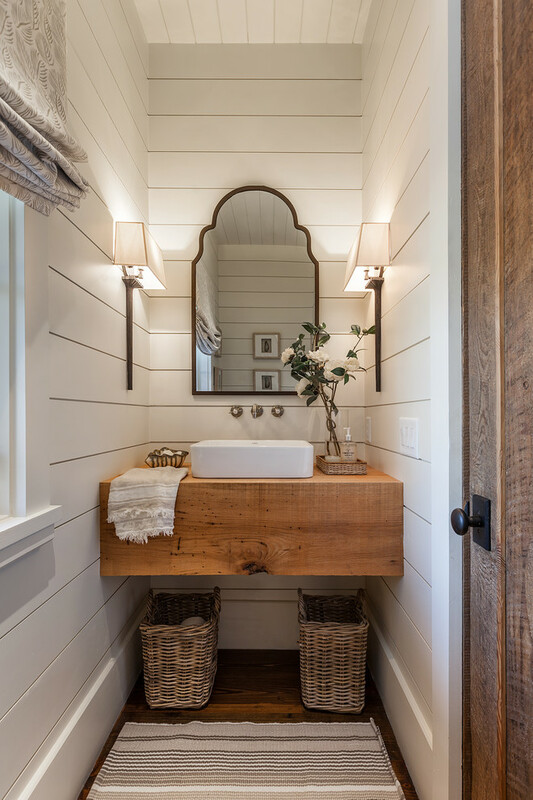 An inspiring farmhouse bathroom vanity equipped with a vessel sink, wood countertop, and additional metal basket for storage solution. 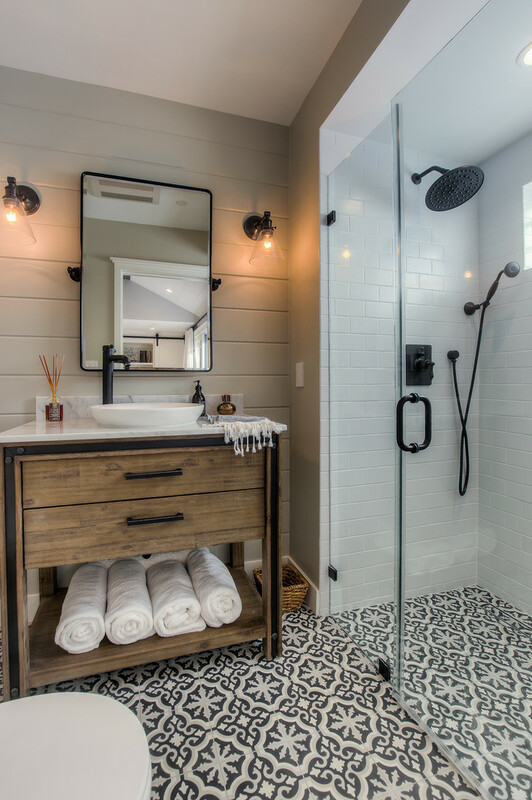 At glance, it leads us to see a clean line interior which has been collaborated with rustic appeal. 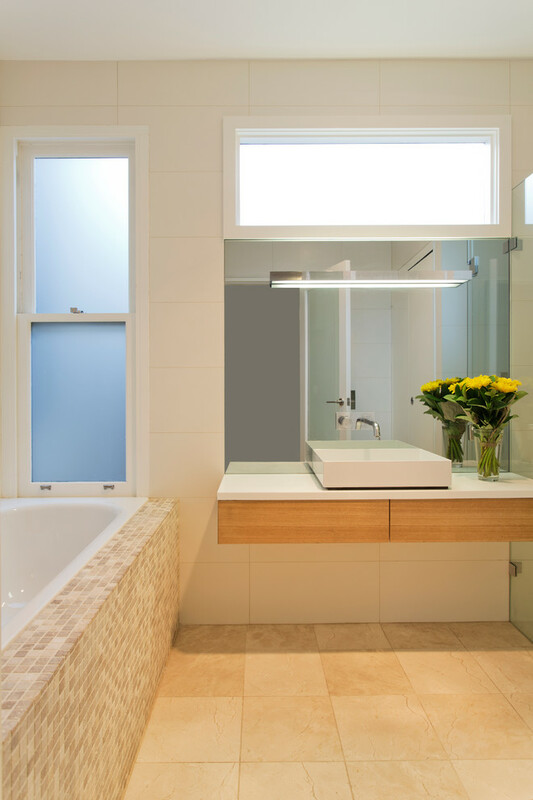 Feature your clean line bathroom fixtures with something colorful and ‘crowded’ for the accents. 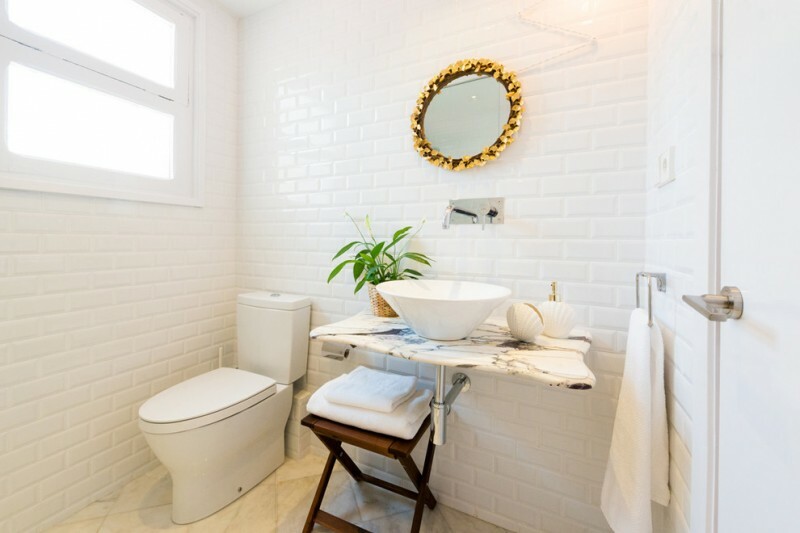 This bathroom idea, for instance, exposures the porcelain tiles floors with modern motifs and clean & soft-colored fixtures like vanity and toilet. They are intended to apply for giving an obvious & beautiful contrast. 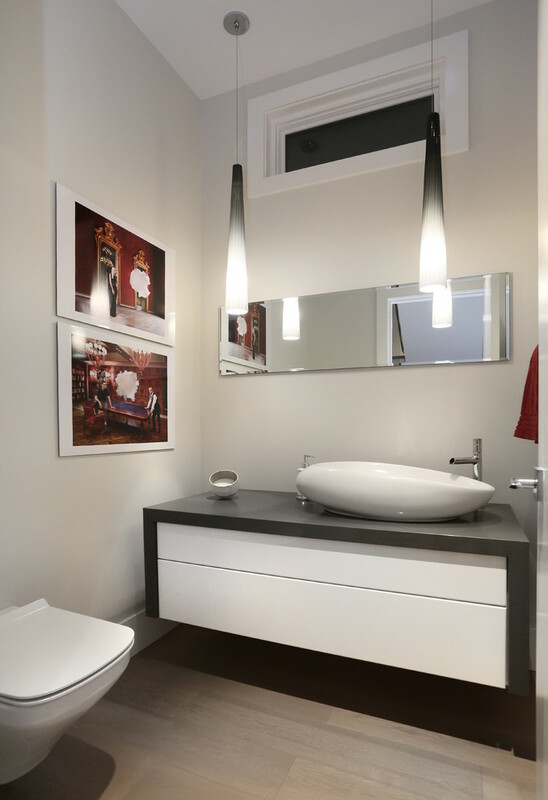 An urban style bathroom vanity idea – Wood is dominating this furniture and porcelain is a bit complementing it. Different to other common vanities, this one offers more spaces for storage. It gives us more options where you want to keep your bath supplies. For your information, the backsplash isn’t real white brick; it’s a wood panel with brick-look-like laminate. 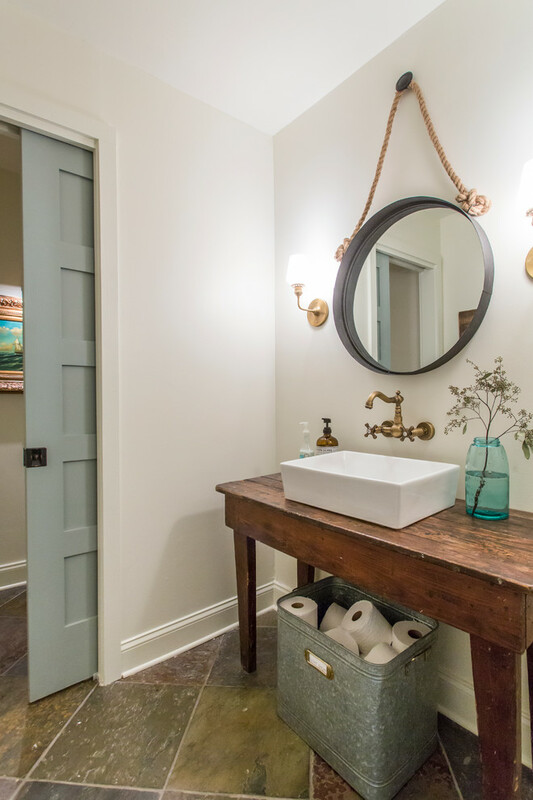 Country charm brings elegance to this custom vanity. Something made by hand always gives special and precious value. 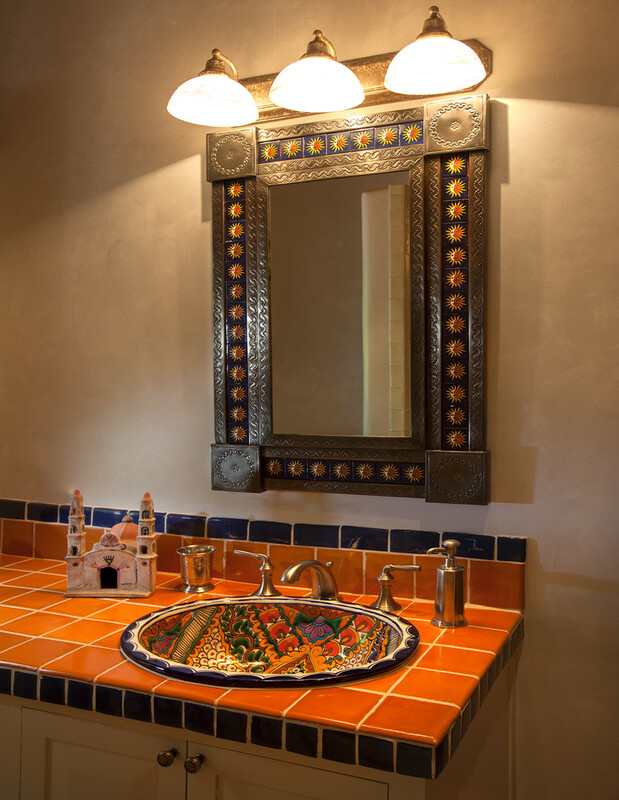 This hand-painted bowl sink, for instance, becomes the most interesting one that can improve the vanity’s value. 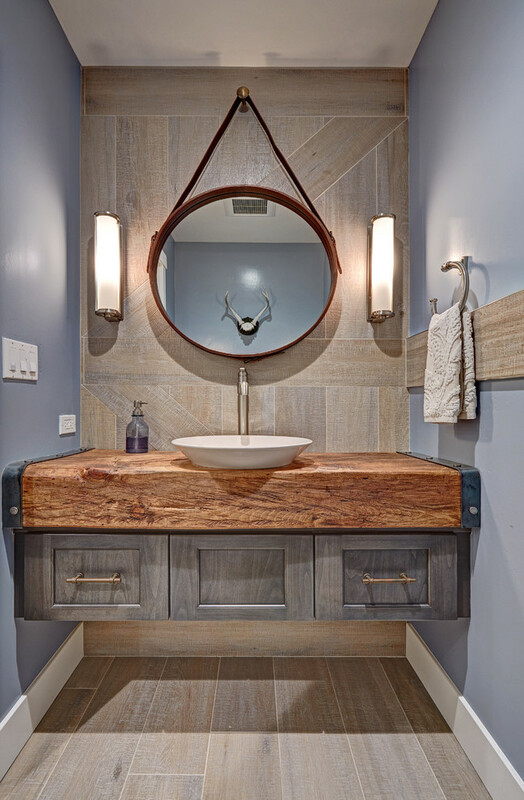 Can’t say what style this vanity is, yet it clearly uses log hardwood as the main material. Modernity obviously appears here, and low-lighted lamps blend perfectly with the furniture, existing a warm atmosphere in this private room. Highlight your bathroom vanity with decorative black lines which may be applied on frames (mirror, cabinets, lamps, and shower head). 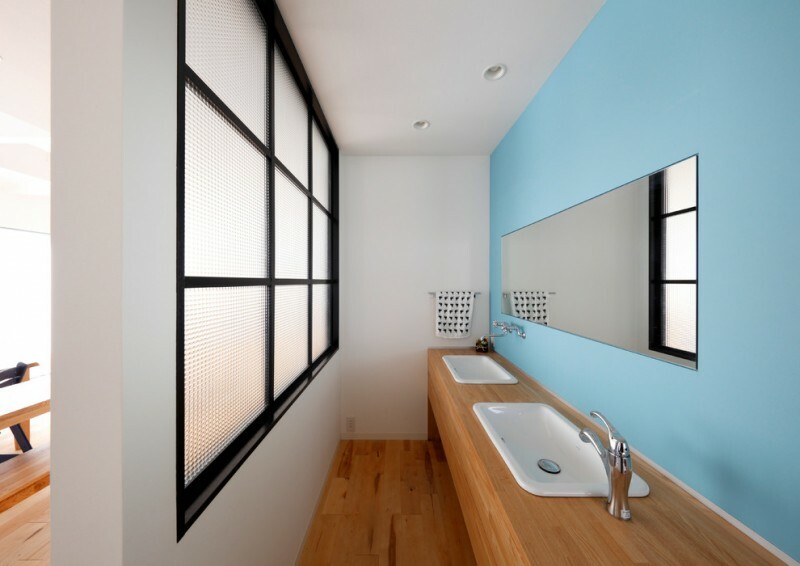 They create clean & obvious to see among white interior. And you know, all these furniture and fixtures are custom. What a lovely vanity! It’s floating and keeps displaying natural value among this modern interior. Bamboos are chosen to make the cabinets more obvious than others. 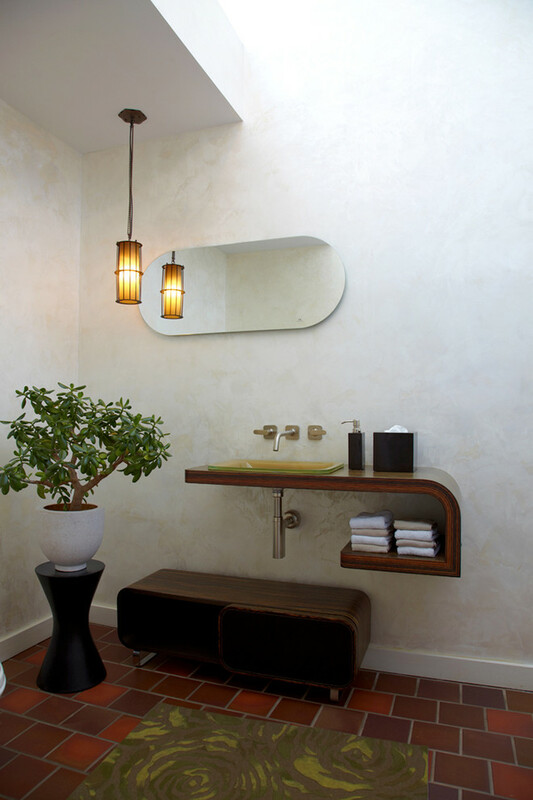 The mirror is also fabulous, the size, shape, and layout are so perfect, existing between the couple of pendant lamps. Black, white, and wood colors are actually good pairs. They produce an obvious contrast when being combined. Each color plays its own boldness without reducing others’ power. The best idea of small bathroom vanity. Light but ‘hard’ look becomes the main point of this design. The owner wants to expose the softness behind its ‘raw’ material. It’s clear to see on the counter in which it’s built from light hardwood without any finishings. Really unique and creative, right? 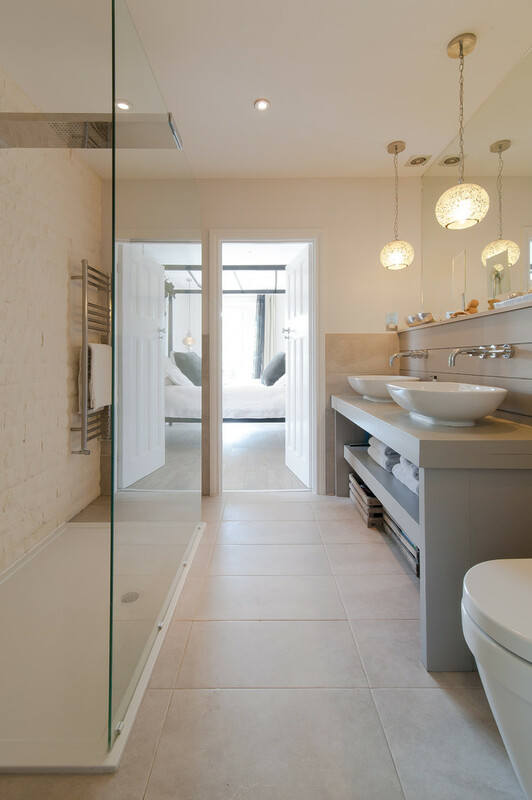 Select old and shabby as the main theme if you want to add something ‘rough’ in your bathroom. 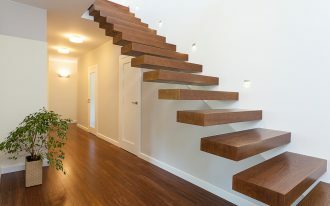 Wood is good idea to choose since its shabbiness is really cool. It can also give a dramatic look. 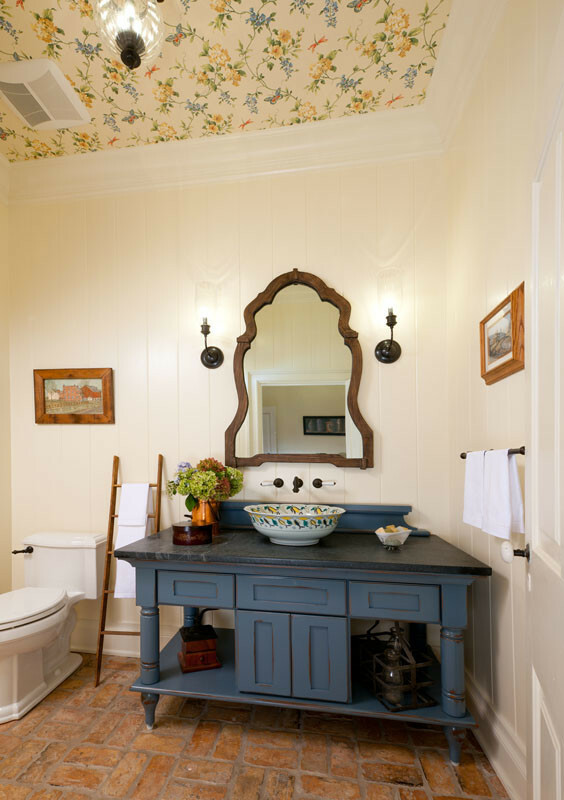 A rustic style powder room furnished with a corner hardwood counter. 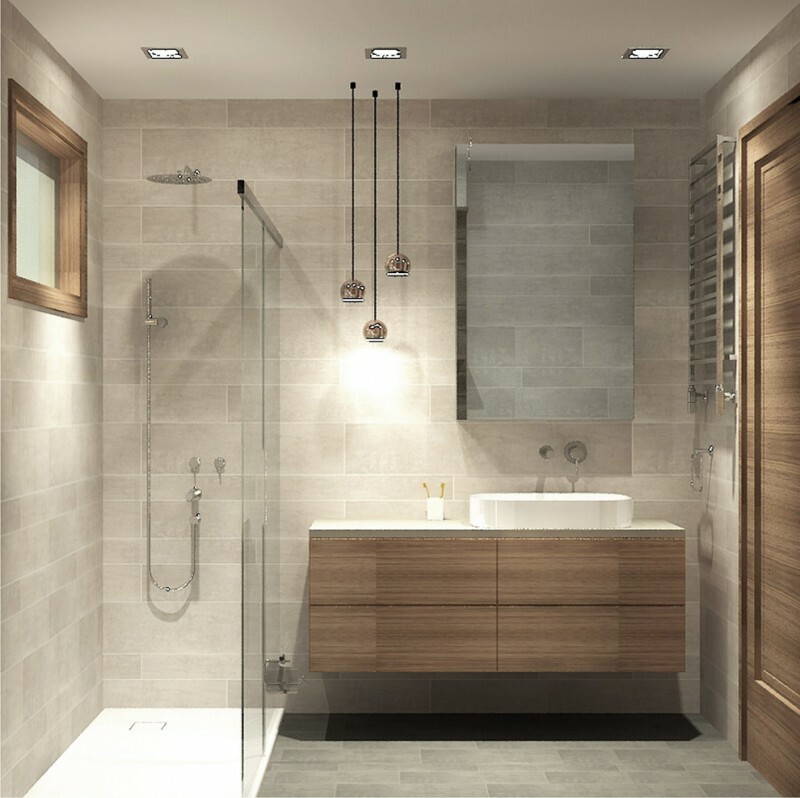 There is no storage solution here, this space doesn’t provide the storage space for keeping or managing bath needs and supplies. But overall, the design is really interesting. 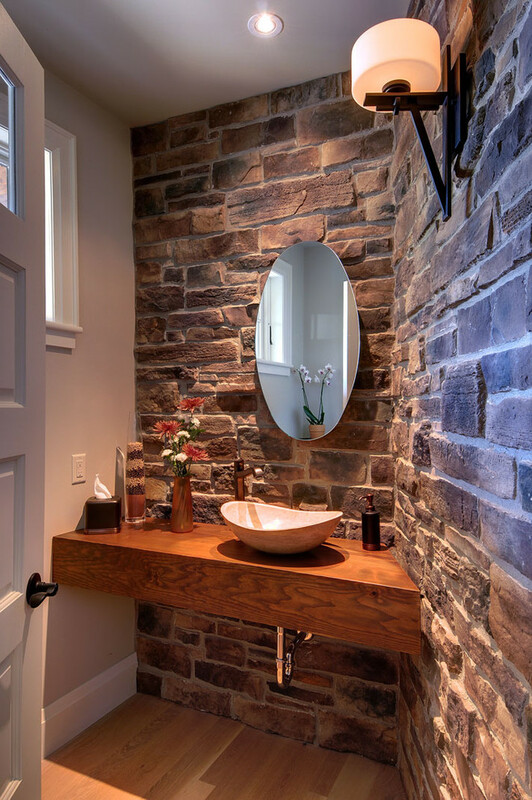 It focuses more on the original idea of raw rustic in which there’s still including hard-textured stones for walls and wood material for floors & vanity counter. A floating gloss vanity for contemporary bathroom. Grey-painted cherry top and sides have framed these flat-paneled cabinets perfectly, they create a simple contrast against the white laminate cabinets. The vessel is also unique in shape, offering another direct interest to attract everyone coming this space. No need more focal points, there is enough by existing a pair of wall decors and frameless mirror to fill the vacant space on these walls. Dark yet gorgeous statement powder room. Here, we’ll discover a deep espresso cabinets and smoked-grey top. 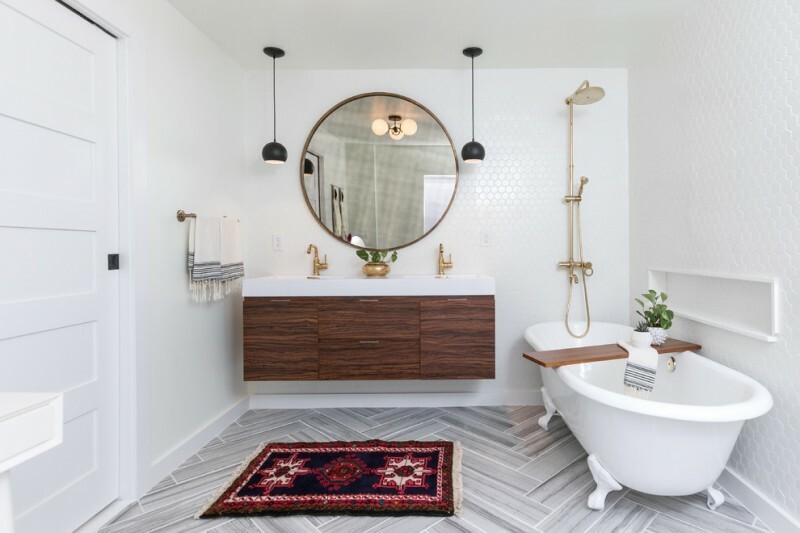 They perfectly complement the wood-framed mirror and dark brass vessel sink. At last, the glass bubbles beautifully illuminate the ‘gloomy’ space with its dramatically gorgeous low light. 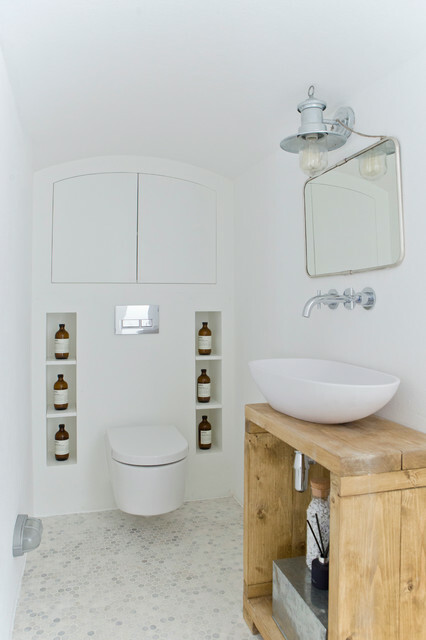 A small sized Scandinavian powder room idea with simplicity and nature as the primary theme. Why nature? 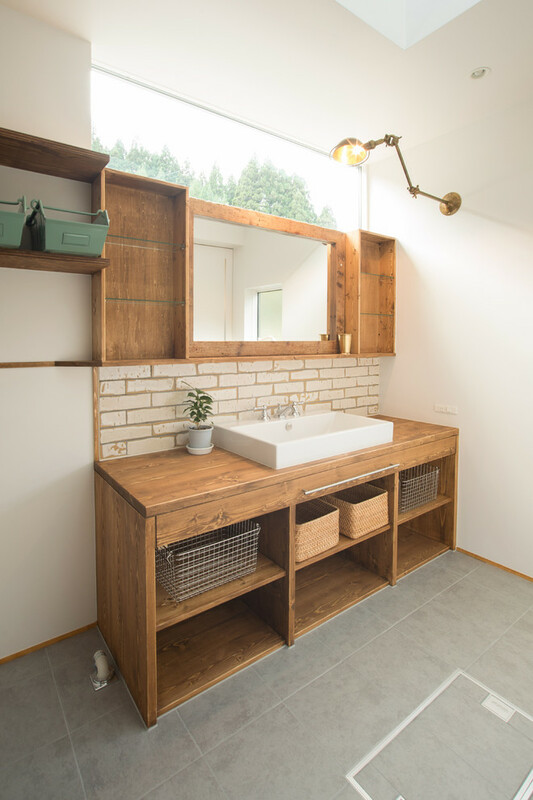 It’s clear to see that this space only includes the natural elements used for building the vanity. The hard stone sink and open-shelf wood cabinet convincingly attract everyone loving such natural fixtures/ furniture. Blue aquatic wall background be the most stunning back for such simply wood vanity. 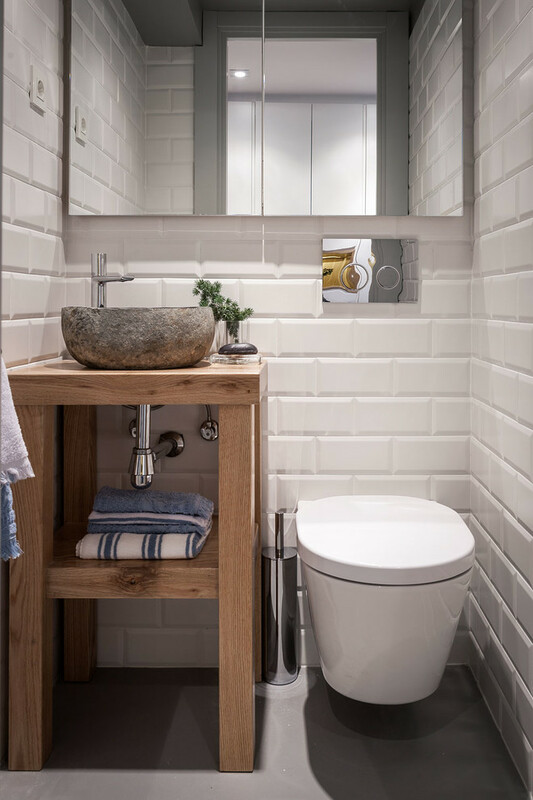 Add a medium-sized basket for a storage solution and higher white vessel sink for maximum use. 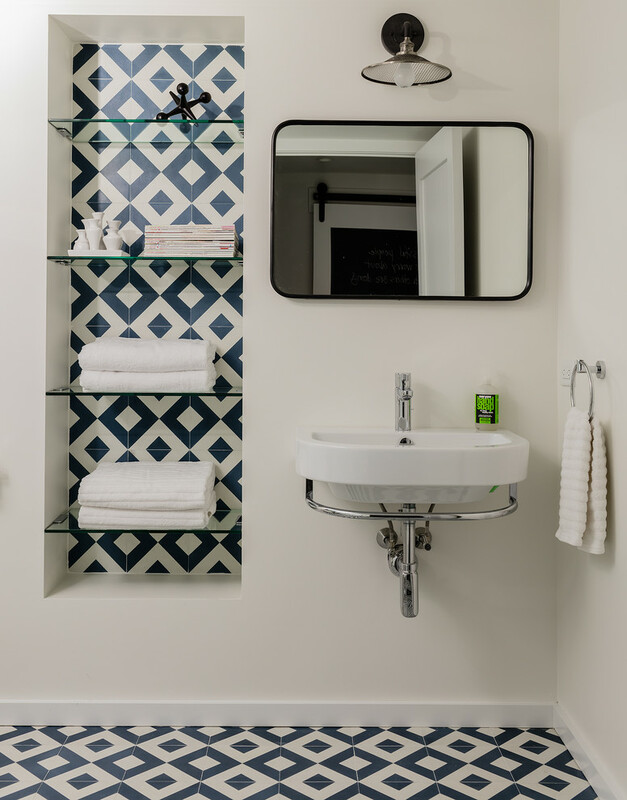 This idea is really best-applied for a small/ narrow powder room. 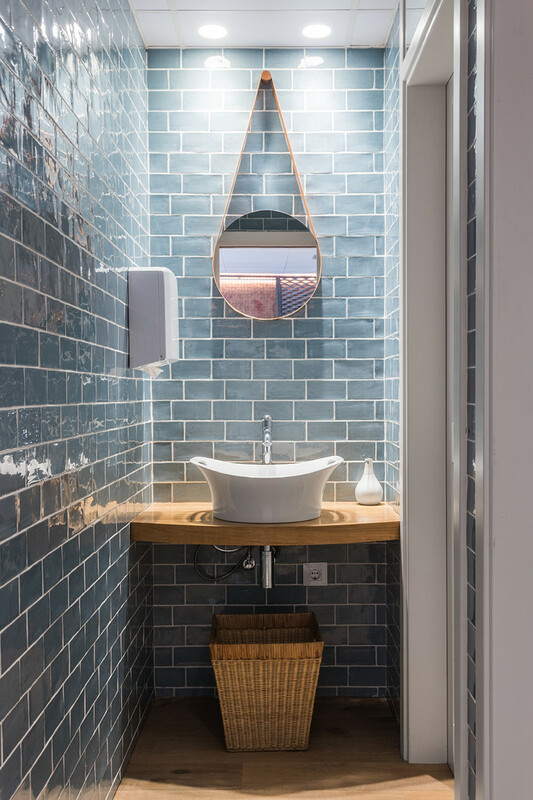 A hanging round mirror has also made a stunning focal point against the glowing blue walls. White and light grey are two components that instantly can create an airy, clean, and visually large space. 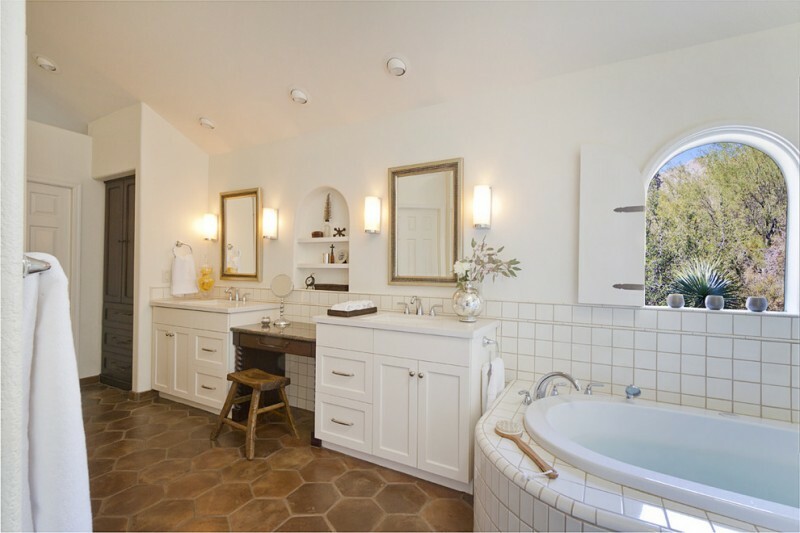 This bathroom, for instance, looks bigger and cleaner just with white-light grey interior. All furniture and fixture are set in white for giving a clean look. What a luxurious and expensive this bathroom vanity is! Just with marble, you’ve got a classy vanity. 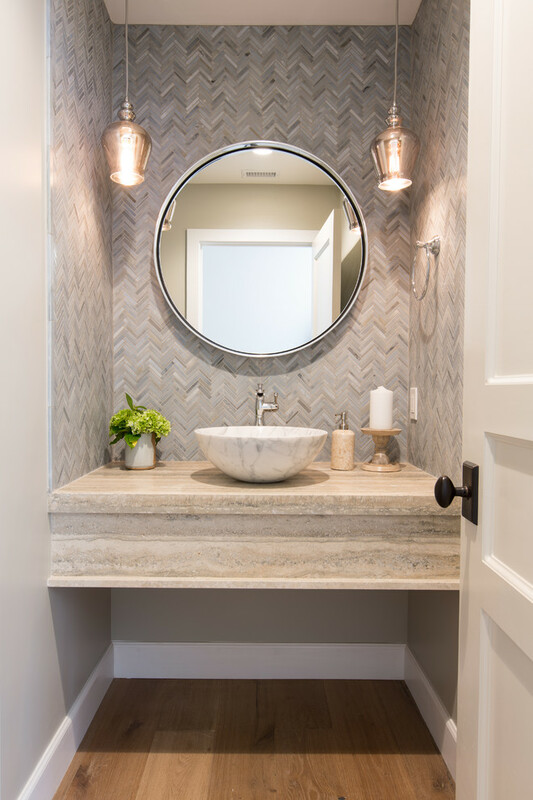 Complement it with the best pairing fixtures and accessories such as a pedestal sink, framed mirror, and a couple of vanity sconces. It’s unique to include a piece of marble board as the ‘table’ for a vessel bowl sink in your bathroom. It’s simpler, no cabinets, no open shelves for storage. An additional x-base chair complements this vanity’s performance. Simpler people love simpler stuffs like this simpler bathroom vanity. 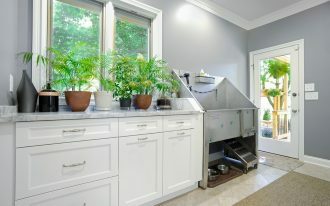 It just employs larger floating farmhouse sink and stainless steel faucet. To complement their performance, round mirror and smaller x-base wood chair have been added. Medium-toned wood is dominating here. It’s perfect for floors and vanity’s countertop where a couple of recessed sink have been installed. Giving a clean lines and warm become one of reasonable statements why most Scandinavian lovers select this idea. A larger mirror seems to be a good idea for such a wonderful vanity since it tends to be an effective spot for two users as well. Custom open cabinet vanity for scandinavian style bathroom. Make it useful for placing a vessel bowl sink. Such vanity idea absolutely fits a simple and clean look interior, and chrome becomes the best match for accenting such elegant bathroom. Really like this vanity. Un-finishing bamboo cabinet looks great with beige tiles walls. Lower pendant lamp makes the space dramatic. The lighting just reaches the particular spaces nearest the lamp. A small minimalist bathroom vanity without any storage solutions. It’s practically a sink paired with stainless steel faucet. Black-framed mirror here is just another complementary item, and a recessed shelves equipped with clear glass panels isn’t only functional, but also decorative. 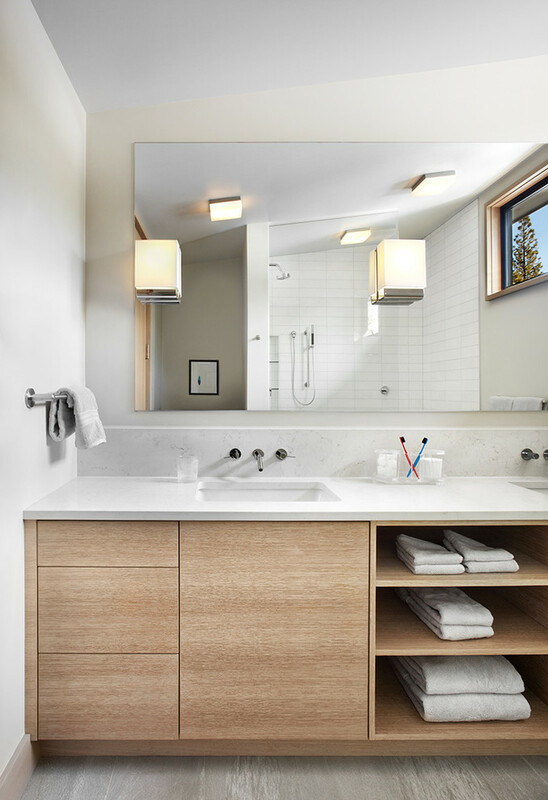 A mixture of wood and fabricated quartz countertop, it’s well-applied perfectly on vanity’s cabinets. The cabinets themselves provide more spaces for storage. The light bars installed along the mirror’s edges give so much brightness, so it’s effective for makeup needs. 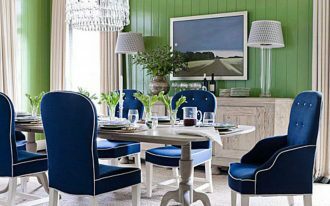 The homeowner wants to highlight a perfect combination of traditional and beach-style. We all know that this vanity and framed mirror obviously represent a traditional idea, but not the color. The color (light neural tone) here tends to be beach-style. These are two separated vanities idea for two. Both are designed in similar tone, model, and layout. They are placed side by side with a centered wood table as their connector. Small and round-shaped stand mirror is added on table for makeup need, and recessed shelving unit here is used as a display for some small ornaments. 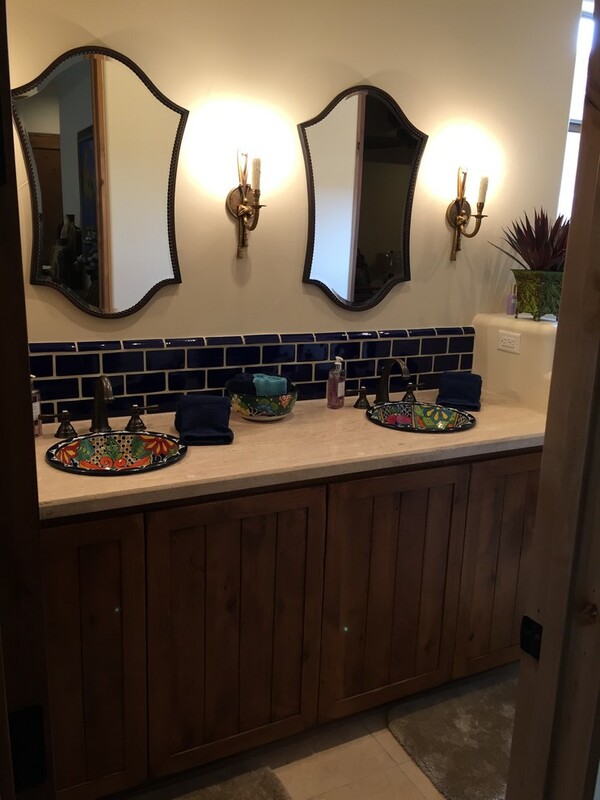 A Southwestern style vanity idea with integrated sinks. The whole design is quite simple yet attractive. The sinks and countertop are made from similar material, solid clay. Dark brass iron fixtures are added to highlight the space. 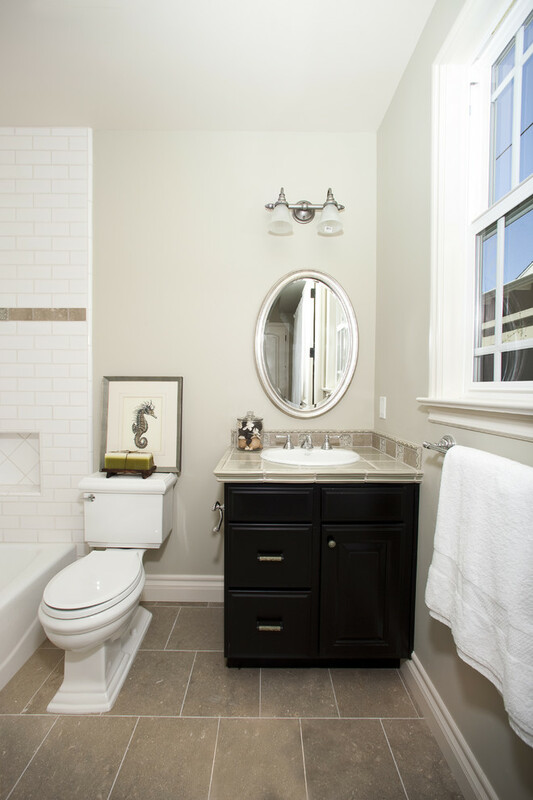 Make your powder room more ‘Wow’ than usual by adding more ‘crowds’ of colors on your vanity. 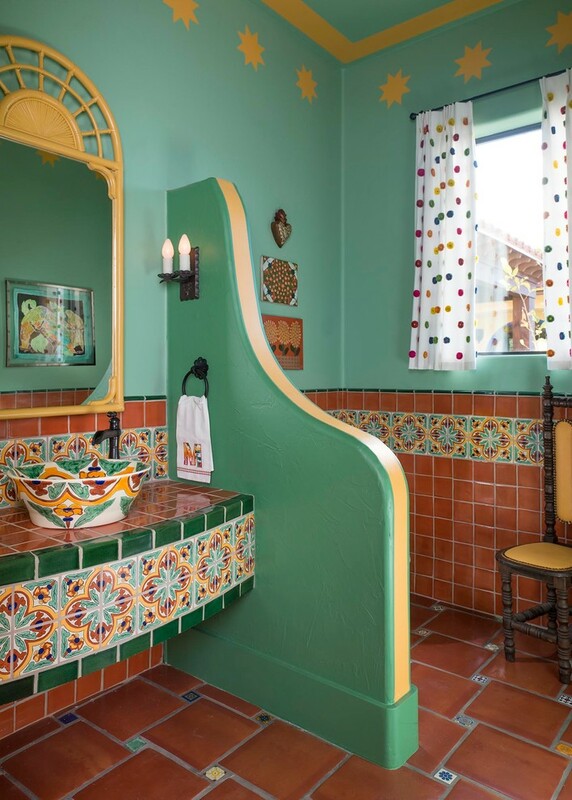 You can use colorful tiles for your counter and its top, or you can also highlight your mirror with pop-colored frame. When you decide to use this idea, consider to select the perfect color combination for the best result. 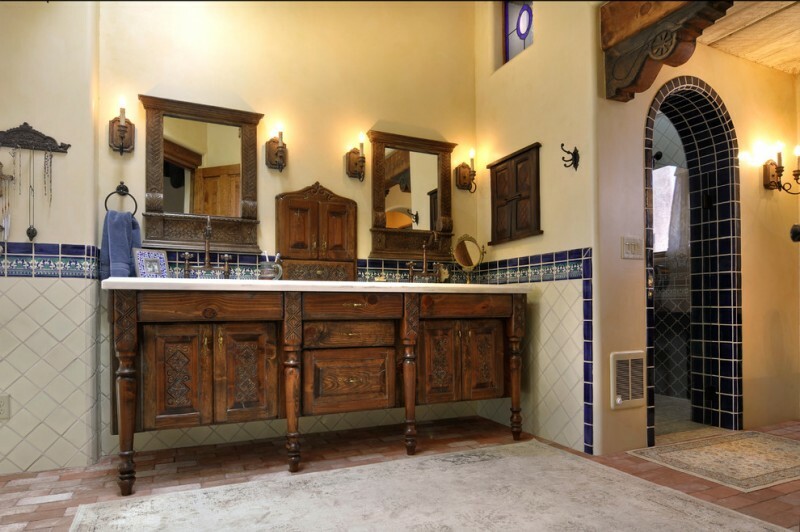 An inspiring Southwest bathroom vanity featuring undermount sink, tiles backsplash, wood-like laminate countertop, and iron brass framed mirror. 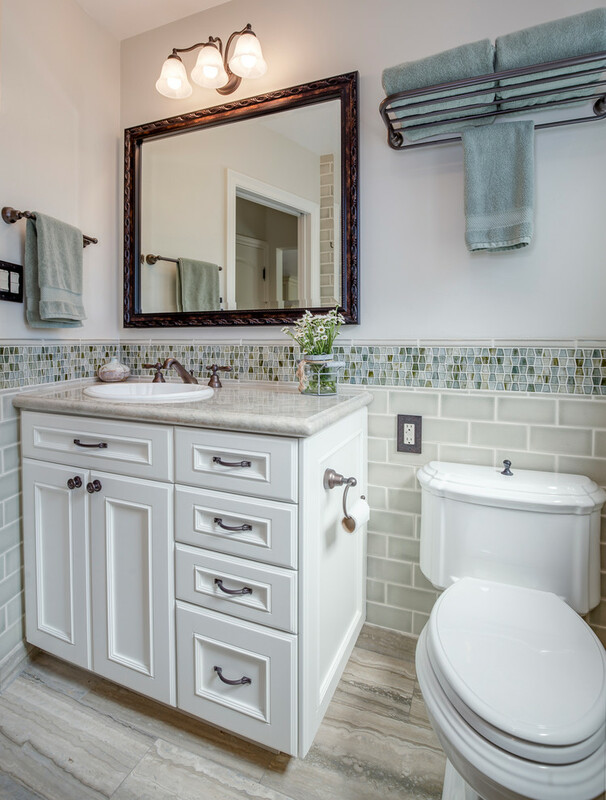 The vanity has a large space of storage unit where you can put lots of bath supplies here. 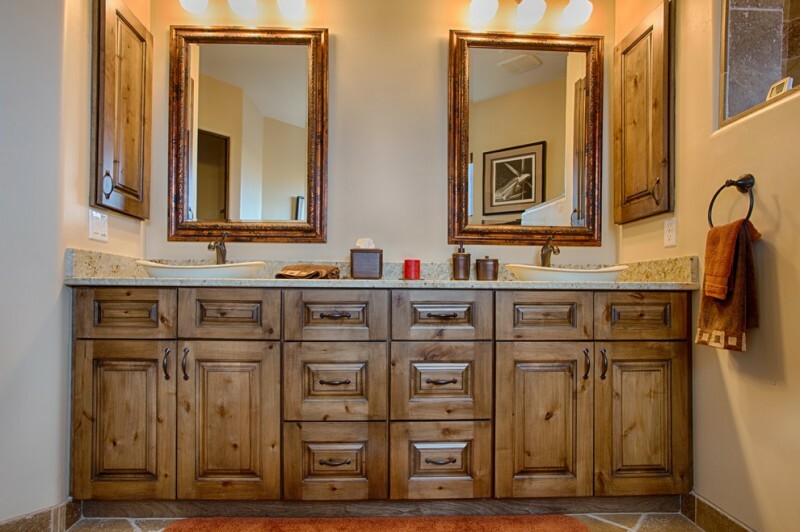 This is a grand bathroom vanity idea dominated by the best wood finishing. The cabinets are completed with raised panels and medium-toned wood finishing. To improve their performance, the designer applies granite as the countertop. The beige walls, indeed, is chosen to create a glowing wood frames on mirrors when they’re illuminated by low-lighted vanity lamps. 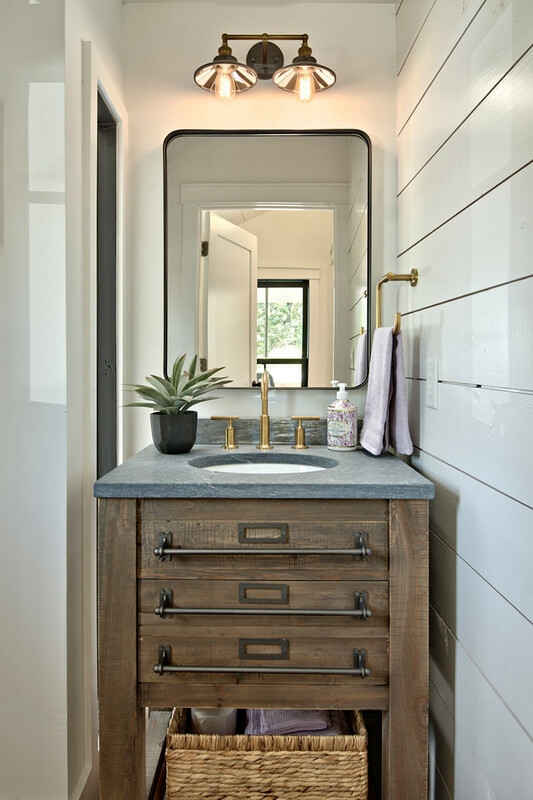 Rustic bathroom vanity idea for a Texas ranch house. The wood cabinets look similar to mustard walls, but they’re not. 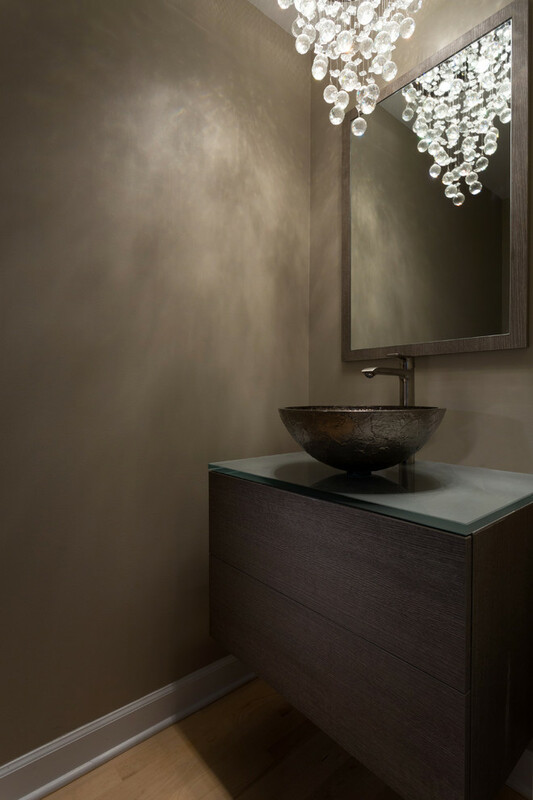 A pair of vanity lamps gives a visual effect of glowing lights that perfectly illuminate the whole areas including the walls and blue aquatic countertop. What amazing it is! 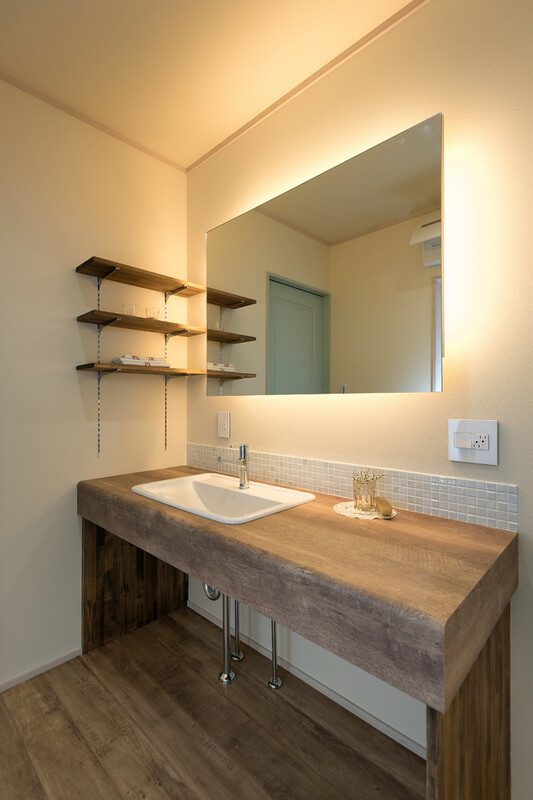 Create old and shabby look in your bathroom by adding solid wood bathroom vanity coated by marble countertop. Select handmade carving for the cabinets and mirrors’ frame to add antique look. Make it much more gorgeous with low-lighted lamps installed in each mirrors’ side. What a gorgeous it is! 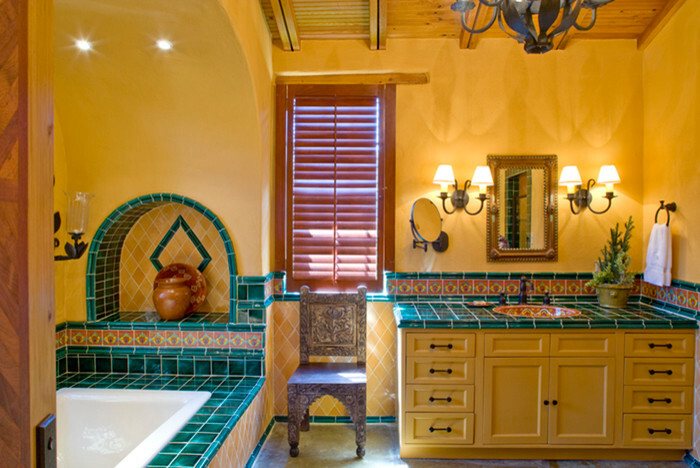 A Southwest bathroom vanity with orange tiles countertop, patterned undermount sink, and flat-paneled cabinets. And, look at the mirror, it’s really beautiful with an artistic metal frame. Plain countertop and dark blue backsplash, the combination offers a beautiful contrast. The countertop also provides a lighter base for multicolored undermount sinks, so it’s easier to make the sinks stand out. Oak cabinets with black countertop seem naturally contrast with the sink. 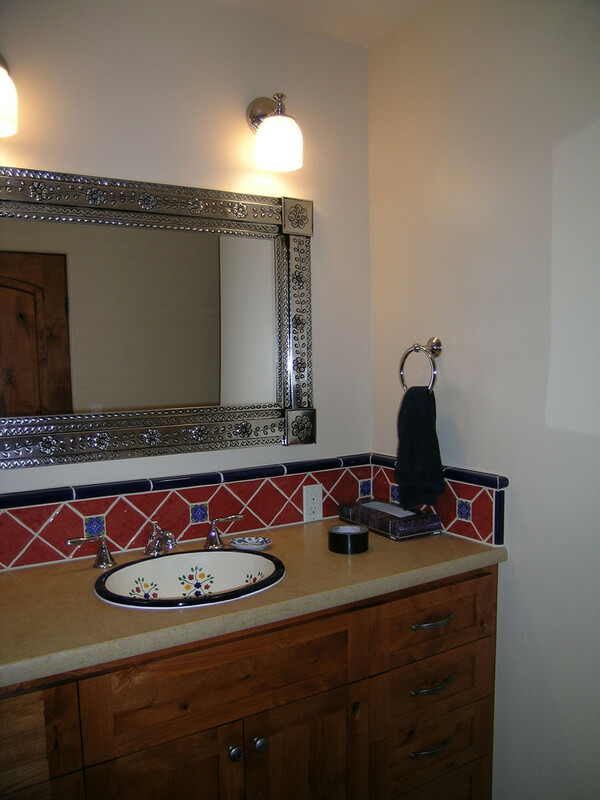 The sink’s color is made similar to the walls, making it a good choice of wall background for the round mirror. Lastly, accent this wall background with a pair of solid black vanity lamps.